​Our work is helping children and teens in crisis third world areas recover and heal. We provide help, healing activities, singing, prayers, services and teaching so children can overcome the hurts of their pasts. Children who have suffered abuse, traumas and abandonment need special help to recover – and we train their caregivers how to help these children. Who are the most qualified people to help the child’s recovery process? The primary caregiver that the child chooses to bond with. We are here to help YOU. We have learned a lot about working with these special children over the years. There is nothing you could tell us about a child's acting out his hurts that we have not heard before. We help caregivers, directors and parents overcome "the tough stuff" children do on their road to recovery and stability. We currently serve a large orphanage overseeing the psychology, social work, internships and healing programs. This website was created due to requests orphanages have for more resources on how to help these children. Although we have had a lot of training and experiences, we still believe that the #1 expert in your child’s life….is YOU. caring families were adopting children from orphanages in Central America. Sadly, the placements were failing. In fact, some of the children were so incredibly wounded, traumatized and acting out that they had to be taken out of their new home and placed in residential care. At times, the adopted children were a danger to themselves and others. Many showed symptoms of depression, anxiety, phobias, stealing, lying, hoarding, sneakiness, sexually acting out, reactively attached, even suicidal and self-mutilating. And yet, these were caring, hardworking, stable, well established religious families who were adopting the children. They should have been excellent places for children. Clearly – these children needed something more – they needed healing in special ways. By invitation, we go to third world crisis areas and begin high-quality, innovative and inspiring services and training, with a strategy to empower nationals to become expert missionaries to their own culture and country. 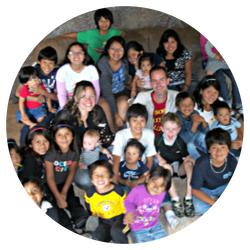 Giving us lots of experience in Central America, we served as the Directors of psychology, social work, volunteers and internship program at a large orphanage in Guatemala. There are far more children growing up in orphanages and on the streets than most people realized. The vast majority of children growing up in orphanages have no hope of being adopted. The go-to system of managing such large numbers of children-in-crisis in 3rd and 4rth world countries are orphanages. Every child growing up in orphanages has suffered trauma, and many have suffered unspeakable abuses. In Central America, orphanages can also be utilized as safe houses, psychiatric wards or temporary housing. Many of the children do in fact have families – however due to abuses, dangers and bad living conditions, children are sent to orphanages. In order to oversee such large numbers of children, orphanages often hire low-paid staff to watch the children. Every single adult overseeing these children NEEDS SPECIAL TRAINING. Our work is equipping these caregivers who all of a sudden have the most important job in the world – raising hundreds of children who are in need of recovery and healing. We also work at orphan prevention and successful transition out programs. After requests by directors, parents and caregivers for more resources, we created this website to help others.